The original Spiraled is 3 years old and was a happy coincidence created playing with leftover half-square triangles (HSTs) on the design wall. Besides the scrappy spirals, I especially liked how just a few spirals escaped into the barely contrasting border - and even the binding. This was my first try at Angled Matched Binding. Since then, I've created 2 more versions. Spiraled Jungle was made a couple of years later when a bundle of Sara Lawson's Jungle Ave. appeared in my mailbox. This time I enhanced the background with a low-volume print, both the border and binding held a bit more contrast, and the spirals were rearranged. And finally, Spiraled Underground, made with just 3 fabrics and finished with a faced binding. It was during the making of this one that I wrote the Big Batch HST tutorial, which just works so good when you want lots of HSTs with the same fabric pairing. All this looking back to say . . . I've finally written up a Spiraled tutorial. Based on version 3, it would be super easy to do it scrappy or more controlled. A pretty straight-forward combo of 2" (finished) half-square triangles and squares, it's well-suited to your own personalization. Click here for the tutorial, and have fun! 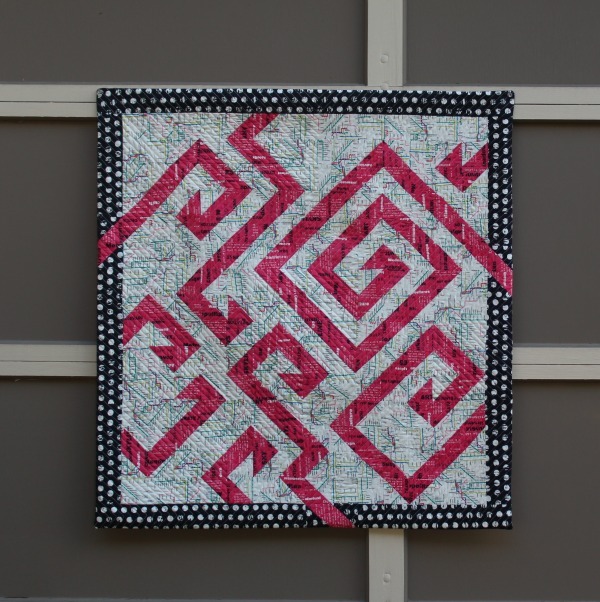 If you give Spiraled a try, please feel free to add it to my flickr group, Quilting with A Quilter's Table. I'd love to see your take on the design. LOVE this...Thanks for the tutorial...can't wait to play with this! Thanks so much for sharing this pattern. I love this design! 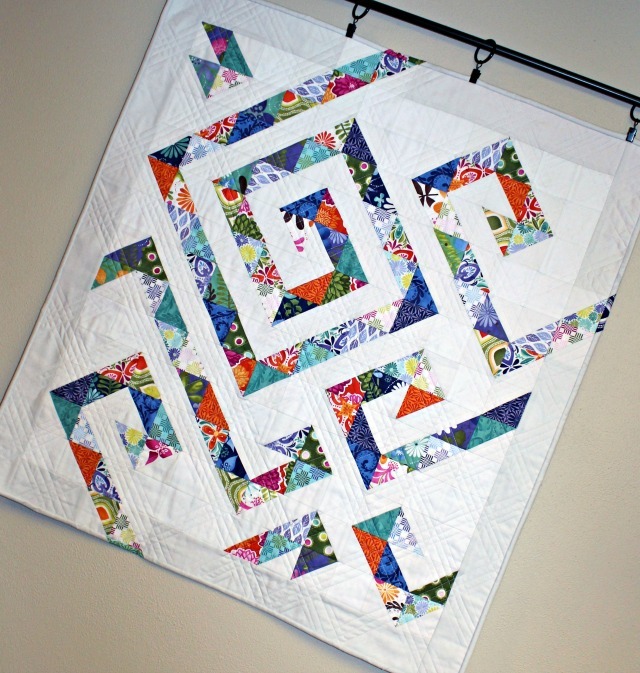 Thank you so much for this tutorial Debbie - love the Big Batch HST one too! All your versions are wonderful and the angled matched binding and facing puts them over the top. The way the lines engage the edge of the quilt is a cool design feature. 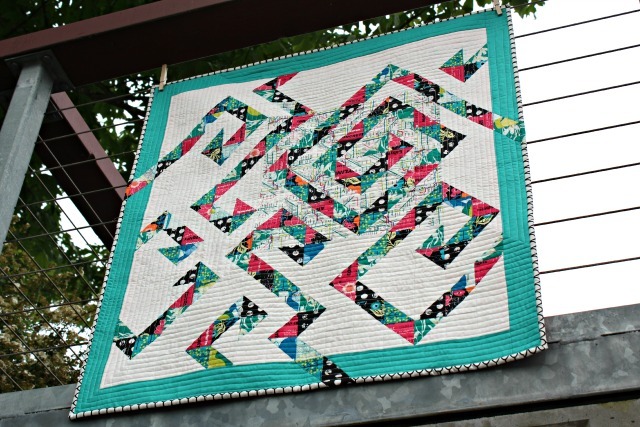 Great quilt - thanks so much for putting together a tutorial! Thanks I love this quilt! I also loved your pouch so much I ordered the Lola and Anna patterns from her. Thanks for all the work you have done to make this tutorial available to us! I can hardly wait to give it a try! I've kept this tutorial for the last year thinking I'd make it some day. I'm not the best at remembering what I'd like to make (and obviously not good at writing it down) so I was very surprised at myself when I remembered the tutorial this weekend. I have a fat quarter bundle (same print but in 9 different colors) sitting for way past its expiration date. I decided to pair the two together. I would really like to fuss at you for not pointing out that a 32x32 quilt (I think mine will be a bit bigger but still baby size) is 256 little 2.5" squares that I have to keep straight and sew together....LOL...It's the cool quilts that always cause us to laugh at ourselves, right? Anyway, all of the colored parts are currently in the middle of my living room floor (what can I say? I was watching tv) waiting for me to cut more white squares. It will be coolishly awesome when I finish but I might need an adult beverage when it's finished!